Add some fun to your guests' kitchens with these heartfelt gadgets! 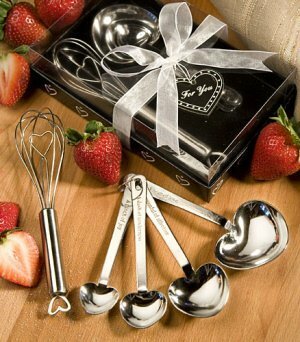 Each set features a stainless steel wire whisk and set of heart-shaped stainless steel measuring spoons. Whisk measures 6" by 1 1/2" and each measuring spoon has a "love-ly" saying on the handle - "a heap of love", "a spoonful of affection", "a dash of tenderness", and "a pinch of joy". Packaged in a deluxe clear-topped box measuring 4 3/8" x 6 3/4" x 1 3/4" with black velvet insert and black heart-design base, wrapped with a white organza bow and finished with a heart-shaped "For You" tag. This is the Measuring Spoon and Whisk Favor Set by Fashioncraft. It comes in a lovely box, with little heart shapes around it and a sheer ribbon and a little 'For' note sign. Ooh, as you can tell, this is made of very high quality metal. Just taking out the Measuring Spoon. It looks like I'm gonna have to cut this one. Has little sayings on the spoon handle there: "A pinch of joy, a dash of tenderness, a spoonful of affection, a heap of love." Very nice. And then this is a little whisk with a little heart shape at the bottom. Here, I can take this out. There you go. It is very high quality, sturdy, as you can tell, and a perfect wedding favor for your guests who love to cook, or they can display it on a wall, 'cause it is actually very lovely. 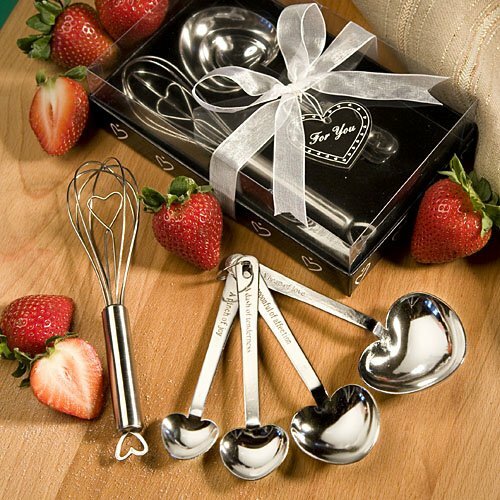 Are these measuring spoons and whisk favor sets stainless steel? Do the spoons have the size listed on them 1tsp, 1/2 tsp, 1/4 tsp, 1 TBL spoon ?